Anyone who has seen the blockbuster film “Slumdog Millionaire” would remember one scene above all others. I am referring, of course, to the “potty scene” where the young Jamal is shown relieving himself in an open pit. The scene caused a lot of adverse reaction in India as unrepresentative of true India. But according to a joint study conducted by the World Health Organization and UNICEF, 665 million Indians, or nearly two-thirds of them defecate in the open. I am not sure if these 665 included people using indoor toilets without plumbing; if it did not, then the number of Indians defecating in an unhygienic manner is even greater. I love traveling by train when I am in India and have many enchanting childhood memories of such travel. But one of the less enchanting memory is of seeing people relieving themselves in the open whenever the train passed some open areas in the mornings. Some of these people would stand up holding their pajamas or dhotis to protect their dignity at the sight of the approaching train; most would carry on without paying any attention to those seeing them perform one of their most private functions. I never thought of this as anything abnormal and it took a foreigner for me to realize how demeaning this scene was. That was when I read V.S. Naipaul’s “An Area of Darkness”. Naipaul, a Trinidadian of Indian origin, was aghast at seeing such scenes when traveling through India for the first time. I realized then that what I had taken as something natural was somewhat unique to India and Indians. Whereas people in other undeveloped countries may be forced into defecating in the open, they won’t accept it as something normal as we do. Another thing unique about India is the way we treat those who take care of our excrement. During my childhood in Lyalpur as well as the first decade of my stay in Delhi, our house and, indeed, the street on which we lived did not have indoor plumbing. A woman came to manually scrape our excrement with a pick-up and transfer it to a larger basket -tassla- which she carried outside on her head. Like everyone else, I also avoided her touch as if touching her would somehow make me touch the feces that she just cleaned and carried. She was not allowed to touch our water taps, we would pour water in a bucket reserved for this purpose while she stepped a couple of steps away from us. It never occurred to me that there was something wrong in my behaviour: But it did so to a Brahmin kid growing up in a village in Bihar. Bindeshwar Pathak, a six year old boy, wondered what would happen if he touched such a person. When he did, his mother was hugely upset with the sacrilege he had committed and made him swallow cow dung and urine and bathe in the water of the holy Ganga to purify him from his “polluting” activity. He realized that "If they (scavengers) continue to clean human excreta, they will not be accepted into society." People who clean and carry human human waste, which we euphemistically call night soil, have been known by various names. We used to call them bhangi or bhangan. In military cantonments, they began to be called jemadar or jemadarni for some obscure reason. Gandhi called them harijan or children of god. But it was the British who coined a term for them for their census purposes which has become a standard expression in Indian English. That term is Scavenger. The dictionary meaning of scavenger is “an animal or other organism that feeds on dead organic matter” or “a person who searches through and collects items from discarded material”. In India, however, the word generally means the person who manually cleans toilets. Mahatma Gandhi was perhaps the first Indian who recognized the indignity of the job of a scavenger. As anyone who has seen the film “Gandhi” would know, he started the practice of cleaning after himself when he was in South Africa; not only that, the male chauvinist in him forced his wife to do the same, bringing tears to her eyes. Later on, when he started his Sabarmati Ashram, he made it a rule that all inmates of the Ashram would clean their own toilet. Dr. Bindeshwar Pathak is a Gandhian. Gandhi lived among the “harijans” so that he could experience first hand the humiliating conditions under which they lived. Pathak did the same. He lived among scavengers for three years to be able to feel their pain. He realized that the only way to get rid of the unhygienic state of toilets and to improve the lot of the scavengers was to develop a low cost sanitary toilet which was affordable by ordinary households and, at the same time, eliminated the need for scavengers to carry human waste. He then founded a movement called “Sulabh International” and developed a simple, low-cost toilet which cost approximately Rs. 700 and could be installed anywhere, including villages without any plumbing. This toilet uses only 1.5 litre of water for flushing as against 10 litres by a conventional toilet. The toilet “system” consists of two pits: when the first one fills up, it is closed and the other one is used. The closed toilet dries up in two years when it is ready to be used as fertilizer and for conversion into biogas for heating, cooking, and generating electricity. Sulabh international has succeeded in raising the percentage of rural population with access to a toilet from 27% to 59%. The movement has also installed 5500 public toilets in the cities and places of tourist attraction throughout the country. Anyone who has used public toilets in India knows how filthy and nauseating they are. Public toilets built and maintained by Sulabh charge a nominal amount for their use but they are much cleaner than other public toilets and a boon to visitors with a need to go. The system has since been exported to many developing countries of Asia and Africa. It has been recommended by the United Nations HABITAT and Centre for Human Settlements, as well as by the United Nations Development Program (UNDP). Sulabh International Social Service Organization has launched operations in Bhutan and Afghanistan. It has, together with UN-HABITAT, trained engineers, architects and others from 14 countries in Africa. It is planning to work in Ethiopia, Cambodia, Laos, Angola, Madagascar, Dominican Republic, and Tajikistan. The Sulabh system removes the need for scavenger; therefore, Pathak’s organization started training schools to prepare them for alternative jobs. These included a training school for women in Rajasthan to train them in tailoring, embroidery, food-processing and beauty treatments. Some of these women went to New York City to participate in a fashion show held at the U.N. headquarters to celebrate the International Year of Sanitation. In recognition of his services for efficient water management, Dr. Pathak was awarded the 2009 Stockholm Water Prize. The award was created in 1990 to recognize achievements in water science, water management, water action or awareness building and carries a cash prize of $150,000. If India could produce another 100 Pathaks, it could really begin to shine. Although the practice of manual scavenging became illegal in India in 1993, there are still 115,000 scavengers working in the country today. Dost_Mittar, the author, is a Canadian of Indian origin. He is a retired policy analyst with the Canadian government living in Ottawa. He does consulting work, mostly with governments, if and when "I get an assignment without looking for it. My hobby is to get away from Canadian winters as much as possible". Can Slumdog Success Help Poor Children? I am glad to see Mr. Pathak doing something about it, rather than simply denying the existence of the problem. South Asia can use many more committed social entrepreneurs like this extraordinary gentleman. And I will be equally delighted when intellectual muslims of Pakistan see what is the root cause of all problem in Pakistan (incl. complete lack of progress). Hint: The first 3 letter of that problem is ISL. But hey no one can dare say that if he wants his dead to remain above the neck. dcrunchr: "The first 3 letter of that problem is ISL. But hey no one can dare say that if he wants his dead to remain above the neck." This is off topic but I'll respond to it any way...just once. Muslims have seen over a thousand years of glory followed by a couple of hundred years of darkness in Islam's 1400 year long history. The fundamentals of Islam have not changed, only the practitioners have....not all of them, but enough of them to impede progress, particularly in the post-colonial period. Check this website. Per this site India is ranked 45, China 75 and Pakistan 99 in prosperity index. You can read about the above in forbes. Congratulations on the latest set of explosions to rock you country. Anon: "Per this site India is ranked 45, China 75 and Pakistan 99 in prosperity index." These index bears no resemblance to the reality on the ground or the reports from various UN agencies concerned with hunger, poverty, education, sanitation and healthcare. You are free to believe Forbes, a conservative American publication that celebrates the extreme excesses of capitalism, while downplaying the basic welfare of the ordinary folks. These index rankings bear no resemblance to the reality on the ground or the reports from various UN agencies concerned with hunger, poverty, education, sanitation and healthcare. But you are free to believe Forbes, a conservative American publication that celebrates the extreme excesses of capitalism, while downplaying the basic welfare of the ordinary folks. Anon: "Actually riaz you could throw some light in the same line on the terror and impact on the same in the life of ordinary pakistani"
Thanks for sharing it. It talks about the terrible results of the powerful insurgency Pakistan faces, and expresses frustrations shared by many in the poor governance and the absence of leadership by the political parties. However, it says nothing about a sanitation emergency, which is the subject of this post. Very nice. Proper santiation is a key step to developing a modern ( not civilized) socieity. When I was in Bangaldesh in 2007 I tried to impress on my rich friends to start a movement to teach proper hygiene to the poor and the slum dwellers. This step alone will eradicate so many epidemics that create havoc with the population. Of course, the other component of my 'lecture' was to get a supply of clean water to the slum areas. Clean water and proper sanitation were not always present in the West either. Even though a patent was issued in 1775 for a flushing water toilet it did not become popular until 60 years later in Europe. It was really after 1879 with the invention of light bulb and soon after with the commercial distribution of electricity to homes and businesses that supply of clean water became possible. Before then, even in Europe and America conditions were miserable regarding sanitation. People commonly went out to relieve themselves and night soil was a commonly used term. In NY City men would carry pots in the streets of Manahattan and people would pay them a few cents to relieve themselves in it. Outhouses were a standard part of all homes and businesses. During winter season, when the rich and wealthy had a party or a wedding in their Mansions it was not uncommon for guests to relieve themselves in the stairwells rather than take a walk in the cold to the outhouse. In the 1960's when I lived in Bangladesh I remember that some of the well to do and upper class locals who lived in areas where there were no public sewer lines had outhouses also. And a Bhangi would come each morning to clean out the outhouse vats. In Karachi in the slums and poor areas, as late as 2003, I saw children defecating in public, sitting over drainage ditches, on the side of the streets. March 4 (Bloomberg) -- Until May 2007, Meera Devi rose before dawn each day and walked a half mile to a vegetable patch outside the village of Kachpura to find a secluded place. The toll on human health is grim. Every day, 1,000 children younger than 5 years old die in India from diarrhea, hepatitis- causing pathogens and other sanitation-related diseases, according to the United Nations Children’s Fund. For girls, the crisis is especially acute: Many drop out of school once they reach puberty because of inadequate lavatories, depriving the country of a generation of possible leaders. 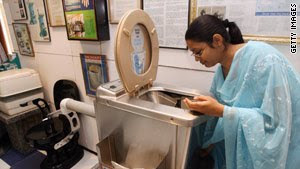 “India cannot reach its full economic potential unless they do something about this sanitation crisis,” says Clarissa Brocklehurst, Unicef’s New York-based chief of water, sanitation and hygiene, who worked in New Delhi from 1999 to 2001.
n slum areas, in which more than half of Mumbai lives, an average of 81 people share a single toilet. In some places it rises to an eye-watering 273. Pakistan's water quality is not good, but it is significantly better than in India. On page 288 of his book "Water management in India" the author P. C. Bansil quotes a UN study that says India ranks a poor 120 on a list of 122 countries in water quality. India's neighbors Bangladesh, Nepal, Sri Lanka and Pakistan rank much better at 40, 64, 78 and 80 respectively. Lizette Burgers, the Chief of Water and Environmental Sanitation of UNICEF has said India is heading towards achieving Millennium Development Goal in sanitation as it has put sanitation on national agenda. Addressing a press conference here, Burgers said: “In the case of sanitation, the total sanitation campaign has succeeded in putting sanitation on the national agenda. Sanitation has been showing an increasing trend since 1999. The latest …programme data indicates a sharp acceleration from 2006 onwards and we are hopeful that with further dynamics and sustained supportIndia is inching closer to the MGD target.” Rural Development Minister of West Bengal Chandra Prakash Joshi said the state had achieved the MGD goals for drinking water. “I am happy to say that we have achieved the MGD for drinking water by providing 84 percent of our rural population with access to improved sources of water as compared to goal of 83 percent. However, there is much more to achieve, our goal is to provide every household with an improved source of drinking water by 2012. Our challenge is also to meet the increasing demand from the rural areas to provide piped water and household tap connections. In this sense, we have quite some distance to go,” Joshi added. He further said that provision of sanitation and a clean environment are important to improve health of the people and reduce the incidence of diseases among children. The Programme focuses on sharing India’s development experience and its drive towards achieving the MDGs for water and sanitation. Experts from around 18 countries would visit different states to study aspects of water safety and sanitation. BHOPAL: A dog's life couldn't get worse. A mongrel brought up in an upper caste home in Morena was kicked out after the Rajput family members discovered that their Sheru had eaten a roti from a dalit woman and was now an "untouchable". Next, Sheru was tied to a pole in the village's dalit locality. His controversial case is now pending with the district collector, the state police and the Scheduled Caste Atrocities police station in Morena district of north MP. The black cur, of no particular pedigree, was accustomed to the creature comforts in the home of its influential Rajput owners in Manikpur village in Morena. Its master, identified by the police as Rampal Singh, is a rich farmer with local political connections. A week ago Sunita Jatav, a dalit woman, was serving lunch to her farm labourer husband. "There was a 'roti' left over from lunch. I saw the dog roaming and fed it the last bread," Sunita said. "But when Rampal Singh saw me feeding the dog and he grew furious. He yelled: 'Cobbler woman, how dare you feed my dog with your roti?' He rebuked me publicly. I kept quiet thinking the matter would end there. But it got worse," she said. On Monday, Rampal ex-communicated the dog. A village panchayat was called, whi- ch decided that Sheru would now have to live with Sunita and her family because it had become an untouchable. Sunita Jatav was fined Rs 15,000. An outraged Sunita and her brother Nahar Singh Jatav rushed to Sumawali police station. They were directed to take the matter to the SC/ST Atrocities police station in Kalyan. "When we went there, the officer asked us why we fed the dog," recalls Nahar. "So we went to the DSP in the SC/ST Atrocities department and submitted a memorandum to him, as also to the district collector. But no one has registered our FIR so far. DSP SC/ST Atrocities (Morena), Baldev Singh, recalls, "We got a complaint in which it has been alleged that a dog was declared untouchable and a dalit family fined for feeding it. We are investigating the allegation," said the officer. Both India and Pakistan have Community-Led Total Sanitation (CLTS) campaigns supported by UNICEF, with the aim of creating open defecation free villages through education and funding. For reasons which are not obvious, it seems that the strategy has produced better results in Pakistan than in India so far. One possible reason may be that CLTS India is state driven versus CLTS Pakistan is driven by community champions. NEW DELHI — India’s rural development minister is pushing a campaign on public hygiene, after a recent survey revealed that India accounts for 58 percent of the world’s population practicing open defecation. Jairam Ramesh says the revelation is a source of national shame and a “sad commentary” on society’s failure to address the issue through education and better sanitation. The government says it spends $350 million a year to build rural toilets, but some 638 million still rely on fields or quiet corners. The UNICEF report puts China and Indonesia in second place, with each representing 5 percent of the world’s 1.1 billion open defecators. Ramesh said Sunday that filth was polluting the environment as well as public spaces, and Indian rivers had become sewers.